Iran has not attacked another country for over 200 years. The US is totally broke – America’s Impending Master Class Dictatorship! – and its only asset left is the military. Tension between the US and Iran heightened dramatically today with the disclosure that Barack Obama is deploying a missile shield to protect American allies in the Gulf from attack by Tehran. The US is dispatching Patriot defensive missiles to four countries – Qatar, United Arab Emirates, Bahrain and Kuwait – and keeping two ships in the Gulf capable of shooting down Iranian missiles. Washington is also helping Saudi Arabia develop a force to protect its oil installations. American officials said the move is aimed at deterring an attack by Iran and reassuring Gulf states fearful that Tehran might react to sanctions by striking at US allies in the region. Washington is also seeking to discourage Israel from a strike against Iran by demonstrating that the US is prepared to contain any threat. The deployment comes after Obama’s attempts to emphasise diplomacy over confrontation in dealing with Iran – a contrast to the Bush administration’s approach – have failed to persuade Tehran to open its nuclear installations to international controls. The White House is now trying to engineer agreement for sanctions focused on Iran’s Revolutionary Guard, believed to be in charge of the atomic programme. Washington has not formally announced the deployment of the Patriots and other anti-missile systems, but by leaking it to American newspapers the administration is evidently seeking to alert Tehran to a hardening of its position. The administration is deploying two Patriot batteries, capable of shooting down incoming missiles, in each of the four Gulf countries. Kuwait already has an older version of the missile, deployed after Iraq’s invasion. Saudi Arabia has long had the missiles, as has Israel. Petraeus said the US is keeping cruisers equipped with advanced anti-missile systems in the Gulf at all times to act as a buffer between Iran and the Gulf states. Washington is also concerned at the threat of action by Israel, which is predicting that Iran will be able to build a nuclear missile within a year, a much faster timetable than assessed by the US, and is warning that it will not let Tehran come close to completion if diplomacy fails. The director of the CIA, Leon Panetta, met the Israeli prime minister, Binyamin Netanyahu, and other senior officials in Jerusalem last week to discuss Iran. Pro-Israel lobby groups in the US have joined Republican party leaders in trying to build public pressure on the administration to take a tougher line with Iran. One group, the Israel Project, has been running a TV campaign warning that Iran might supply nuclear weapons to terrorists. Washington is also concerned that if Iran is able to build nuclear weapons, other states in the region will feel the need to follow. Israel is the only country in the Middle East to already have atomic bombs, although it does not officially acknowledge it. The US secretary of state, Hillary Clinton, said in London last week that the US will press for additional sanctions against Iran if it fails to curb its nuclear programme. Europe’s foreign affairs minister, Catherine Ashton, today said the UN security council should now take up the issue. “We are worried about what’s happening in Iran. I’m disappointed at the failure of Iran to accept the dialogue and we now need to look again at what needs to happen there,” she told Sky News. However, China and Russia are still pressing for a diplomatic solution. Tony Blair, Middle East envoy on behalf of the US, Russia, the UN and the EU, continually referred to what he described as the Iranian threat during his evidence at the Chilcot inquiry last Friday. Textual analysis now shows that he mentioned Iran 58 times. Besides the new missile deployment, Washington is also helping Saudi Arabia to create a 30,000-strong force to protect oil installations and other infrastructure, as well as expanded joint exercises between the US and military forces in the region. The move is a continuation of the military build-up begun under former president George W Bush. In the past two years, Abu Dhabi has bought $17bn (£11bn) worth of weapons from the US, including the Patriot anti-missile batteries and an advanced anti-missile system. UAE recently bought 80 US-made fighter jets. It is also buying fighters from France. Petraeus said in a speech in Bahrain last year the UAE air force “could take out the entire Iranian air force, I believe”. 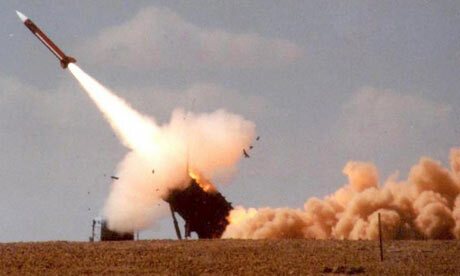 Patriot missiles are designed to intercept enemy missiles before they reach their target. Since production began in 1980, 9,000 missiles have been delivered to countries including Germany, Greece, Taiwan and Japan. During the first Gulf war Patriot success was 70% in Saudi Arabia and 40% in Israel. Since then the US has spent more than $10bn (£6.3bn) improving, among other aspects, the system’s radar and computer compatibility for joint forces action. Once in position, the system requires a crew of only three people to operate. Each missile weighs 700kg and has a range of about 100 miles. The US navy is in the process of upgrading all its Ticonderoga class cruisers and a number of destroyers to carry the Aegis ballistic missile defence system. It uses a surface-to-air missile that is capable of intercepting ballistic missiles above the atmosphere. It has also been tested on failing satellites as they fall to earth. Each missile is over 6m long and costs more than $9m.